Who doesn’t love a good hack? 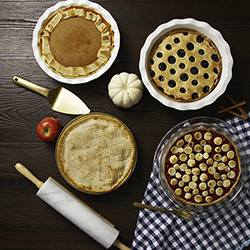 Spice up your typical pie crust by using these beginner methods… easy as pie! Create a textured pie crust without making an extra trip to the store. This fork patterned crust makes this hack jump to the top of the list. Alternate pressing the back of the fork to the crust until the whole surface is covered with markings. Once satisfied with your pattern, attach the crust to the top of your pie and watch your artistic skills come to life. The ribbon method takes a short amount of time, minimal effort, with maximum results. Simply cut the crust into long slices as you would for a traditional lattice pie. Take the slices and start placing the crust in a folding back motion, to create the looks of a ribbon. Your pie will be the best present of the day. Use any circular cutout you have around to create this peek-a-boo pie crust. To show off your delicious pie contents, make dot cutouts, one size of differing, in whatever pattern you desire. Make sure to leave room around the edges for enough crust to attach to the pie. Then, simply place pie crust onto pie and watch the magic happen. Save your leftover dots for another hack below. Tackle another pie crust with the pieces remaining from the peek-a-boo hack. Use the dot cutouts to create a quirky crust of polka-dot heaven. Take the dots, and place atop your pie to create this unique look. Trusty, crusty, delicious dotted pie. Watch these pie hacks come to life!